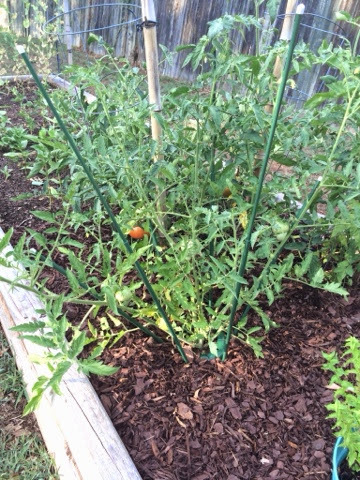 My tomatoes are finally ripening! No, I didn't stick all those stakes in at an angle, they are actually anchored like that from a central ring staked in the ground. This is the Ultimate Plant Cage I was given to try out. Overall it is working pretty well, though it was probably designed with more delicate plants in mind. But the Ultimate Plant Cage has allowed the tomato plant to spread out a little bit, which I'm thinking is good for air circulation and letting in more sunlight. In the typical cages the branches tend to get smooshed together as they grow bigger.